By the summer of 2015, Memphis Depay was one of the most highly touted prospects in world football. One of the driving forces for PSV’s first league title since 2008, he primarily played as the left winger in a counter attacking heavy 4-3-3 formation as his dribbling and massive shot numbers drew comparisons to Cristiano Ronaldo. His arrival at Manchester United was greeted with excitement, as he was one of several signings in that summer window along the likes of Anthony Martial, Morgan Schneiderlin and Matteo Darmian. The acquisitions of Memphis and Martial in particular were gambles on superstar upside, which Manchester United hadn’t done since Wayne Rooney and Ronaldo in the 2000s. Alongside Louis Van Gaal, a manager in which Memphis had previously worked with to grand success in the 2014 World Cup, the move to Manchester if done properly could’ve been where Memphis staked his name as one of the best wingers in Europe. As it turned out, that didn’t come close to happening as Manchester United in 2015-16 were incredibly disappointing with an attack constrained to almost comical levels. It was clear that the lack of shots (11.3 per game which ranked 15th) were part of a grand tactical plan, which Memphis didn’t feature well in whatsoever. All of Memphis’ production massively declined under Van Gaal and with another summer of massive squad retooling under new manager Jose Mourinho, who’s had a questionable resume with youngsters, the immediate future looked much bleaker compared to when he signed. With very limited game time coming his way, moving elsewhere seemed like the logical option to jumpstart a once promising career. That move turned out to be Olympique Lyonnais in January, which on the surface made sense because of their vaunted history for enhancing youth talent. For Memphis, the move has worked out better than even the most optimistic projections could’ve imagined. He’s scored or assisted every 84 minutes, which is an even better rate than his 2014-15 season (95 mins). Visually, he looks like himself again with the blistering pace and dribbling exploits. In terms of all around impact even accounting for a small sample size, few players in his age group have been as good as him this season. So how did Lyon get the best out of Memphis? By in large, letting him be himself again. One thing that’s immediately different about Memphis in Lyon versus his time with United is the amount of freedom he’s given to roam around the pitch when the opportunity arises. It was startling to see just how much LVG restricted the movements of some of his players, and Memphis suffered from this. It wasn’t as if this couldn’t have been imagined. While at PSV, Memphis had the freedom to drift in from the left wing and act as an inside forward because of having Jetro Willems occupy the wide areas. It’s very much a similar situation to what Monaco are doing; having their FBs maintain the width which allows the likes of Thomas Lemar and Bernardo Silva to occupy the half-spaces. Lyon are doing the same thing with Memphis, having Jeremy Morel and Rafael act as time as wingers. 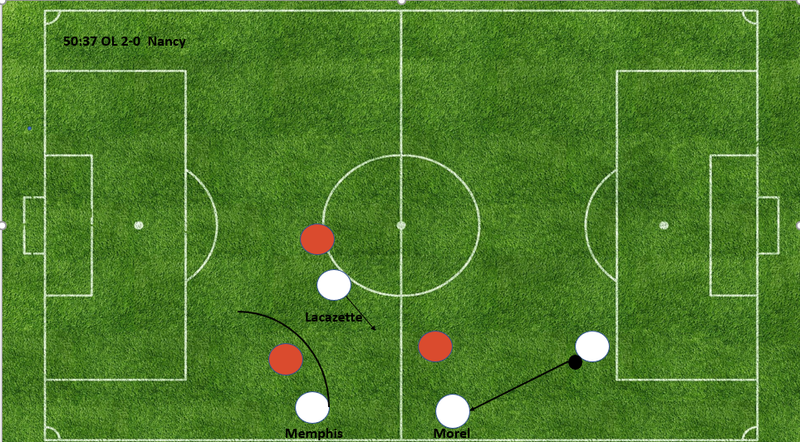 It allows Memphis to act not only closer to his fellow attackers, but also more consistently in his favoured action zone; namely the left half space. When he is hugging the touchline, one way that Lyon try to progress the ball is through creating triangles on his strong side as a means of bypassing the opposition. It doesn’t happen nearly as much as it should, but when it does, it can utilize both the threat of Memphis’ athleticism and his penchant for direct passing into the danger areas. One of the things I’ve most enjoyed seeing with Memphis has been the little fleeting moments where it felt like the trio of him, Alexandre Lacazette, and Nabil Fekir could create magic out of nowhere and it would’ve been so fascinating to see them with a full training camp behind them, trying to create sequences like this on a more regular basis. There were still the growing pains that could be visible among the two. Sometimes the spacing would be off where they both occupy the same area, making it easier for the opposition to defend. There would be times where Lacazette would ask for a throughball pass because he could sense an opening to run into, but Memphis wouldn’t be able to get the pass to him. It wasn’t perfect between the two, but the frameworks for a happy relationship do exist, even if there’s a non-zero chance they won’t play together next season. If there was one knock on Memphis during his time at PSV, it was that for all the clear talents he had, there was still some recklessness when it came to shot discipline. Some of it could be attributed to him being only 21 during his breakthrough season at PSV and you could forgive players for not having refined shooting discipline at that young of age. This wasn’t certainly on the level of players like Andros Townsend, where you constantly wonder whether they know the meaning of a good shooting opportunity. But sometimes it felt like he wasn’t using his natural talents to hunt better shots with more consistency. At Lyon he’s done a much better job in limiting long range shots to an acceptable amount. All wingers to varying degrees will take low probability opportunities, it’s just the nature of the sport. The key is not becoming trigger happy at every opportunity, which in of itself can be attributed to a lot of things (team structure in attack, state of play, score effects, surrounding talent). A lot of times, even the ones that Memphis takes that in theory would be bad shots had varying levels of rationalization going into it. Some have been where he tried to catch the goalkeeper off their line, others have been in transition where the spacing wasn’t good enough to find another option. There’s a good chance Olympique Lyonnais will look considerably different when next season opens. Alexandre Lacazette and Corentin Tolisso stand a good chance of moving elsewhere while Nabil Fekir has had a largely successful return from his ACL tear nearly two years ago, which could see him also be the target of transfer dealings from bigger clubs. While not having the same success as last season, Rachid Ghezzal has been okay and he looks to be leaving on a free as well. It stands to wonder how Memphis would perform in an environment where he is clearly the best attacking option on the pitch, and how much of a decline he could face in his performance when he’d have to carry his teammates. But that’s for another article. In the 933 minutes that he’s played for Lyon this season, Memphis has been one of the most productive attacking players in Europe. Enhanced by the numerous talents that Lyon have, He’s looked miles better than he did during his Manchester United days. He physically looks to be himself again with the dribbling ability to get by people when needed, and he’s upped his shot quality by trading in bad shots for more medium-high quality shots. What happens next season is anyone’s guess for Memphis, but he’s proven that his awful stint at Manchester United was a thing of the past, and he’s returned to being one of the most productive young wingers in Europe.